Madeleine Calder used to be a Manhattan real estate agent, but when the market collapsed in 1989, she suddenly needed a new income stream. "I saw this brief report on CNN about an ostrich farm in Colts Neck, N.J., and said, 'Let's go look.' "
Intrigued, she did some research and purchased four ostriches. She had pens built at her country house in Connecticut and enlisted a friend's nephew as caretaker. "Then the young man said he had fallen in love with Miss Alabama and was moving. I had these four giant birds in my back yard," Calder recalled. "I became very hands-on with my birds." Now more than 20 years later, Calder operates Blue Heaven Ostrich Inc., a 5-acre ranch on a tranquil pine- and palm tree-studded parcel in Loxahatchee Groves, where she moved the enterprise in 2004. Each of the fast-moving flightless birds, native to Africa, has its own personality, Calder said at the ranch on a recent sunny morning. The females can produce as many as 100 eggs a season. Calder eats, donates or sells many of them. She also ships some to ranchers in other states. When the birds are 10 to 13 months old, they are slaughtered and processed at U.S. Department of Agriculture certified facilities. The frozen meat is then shipped to her West Palm Beach warehouse. From there, she fills orders on her Web site (gourmetostrich.com ) and ships products, from "birdogs," an ostrich hot dog, to ostrich steaks, burgers, kabobs and even ostrich-stuffed pasta. Calder declined to provide sales figures because the business is highly competitive, but she said she sells all the ostrich products she receives. Pat McFadden, president of the American Ostrich Association and a Wichita, Kan., ostrich rancher, said the U.S. ostrich industry is small, but on the upswing. "It is getting better every year. 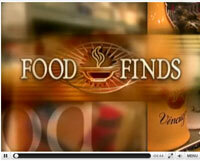 More and more people are wanting the meat and the oil," said McFadden, who cautions it is not a "get-rich-quick scheme." Gourmet Ostrich is proud to have become a proud member of Localecopia, Localecopia is a non-profit organization focused on bringing together businesses, producers, educators and government organizations for the purpose of supporting local product consumption, helping operations better utilize waste and bringing together individuals to help achieve sustainable business practices. Gourmet Ostrich is committed to the support of locally grown food, farmers and ranchers, alike to supply healthy and nutritious locally raised and grown food. 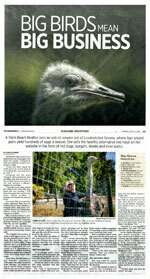 Ostriches: Long-neck birds are a constant topic at Blue Heaven Ostrich Ranch and Bed & Breakfast in Apex. Madeleine Calder shares fun facts about the graceful, perky creatures. Learn why ostrich meat now appears on so many menus (no fat, low cholesterol). Ostriches come inside as photos, feathers, eggshells, and sausage, but not as omelets. One egg equals 24 chicken eggs in volume, far more than even a full house needs. The combination breeding farm and inn was written up in the April issue of Southern Living magazine as one of several B&Bs in the region that put people and animals in close proximity. APEX -- Madeleine Calder didn't stick her head in the sand when it came to seizing a new business opportunity more than six years ago. Now, her Blue Heaven Ostrich Ranch and Bed & Breakfast is turning others' heads. Madeleine has participated in numerous culinary shows and exhibitions across the country, where Pasta L'Autruche has met with unparalleled success. 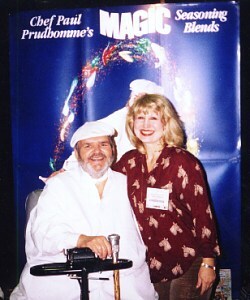 At left, Madeleine is shown with New Orleans' legendary chef, Paul Prudhomme at the New York Restaurant Show and Food Service Show. REGARD the ostrich, one of nature's strangest creatures: Little head, long neck, fat middle. When fully grown, it is taller than the tallest professional basketball center. The ancients called it "camel bird" because, with its ungainly walk and long neck, it looked rather like a camel. And if it's true that the camel looks as if it were created by a committee, the ostrich looks as if it were created by an even bigger committee.